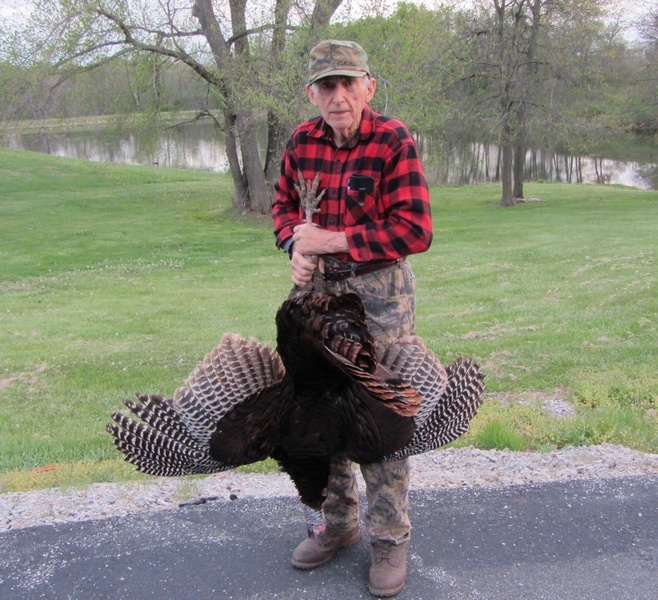 A few days before his 84th birthday, Dad bagged this 26 pounder . . . with a twenty gauge. This is the story of someone who upgraded to a twenty gauge: my father, as a matter of fact. It wasn't a matter of not being familiar with the 20 gauges, for there were 20s, 16s, 28 gauges, and .410 bores at the ready for as long as I can remember. Yet, we are all creatures of habit and old habits die hard. Though Dad certainly used a wide variety of shotguns, it was the same old Browning A-5 standardweight that was hunted with more than any other shotgun. When I was extremely young, we hunted standing corn without dogs. It was easy enough to do, for row crops were not planted nearly as closely together as they are today. Not every piece of land was tiled, and generously wide and grassy fence rows were still in common use. It was common practice to hit a flushing rooster once on the way up and then once on the way down, for if he didn't drop dead in the standing corn, it was a lot of work to try to recover him. For several decades, Dad hunted with an A-5 12 gauge standardweight, 28 inch plain barrel, modified choke. It worked well and still does, for when I was very young, Dad often had two roosters on their way down before before I could get my gun up. You've heard what they say about paybacks? Well, times change. On one particularly cold and windy day, Dad and I were walking out some length fence rows. After I bagged the first two roosters, Dad remarked “that I was about a half of a second too fast.” Aside from being a generation younger, I was using a lighter, faster gun: an alloy Browning B-80 twenty gauge that weighs 6-1/4 lbs. Dad remarked from time to time that “I was too fast” after that. Wingshooters can be staunchly set in their ways and often have an aversion to change: my Dad was no exception. I mentioned to Dad that he really needed to get a faster gun: a 20 gauge. Dad was resistant, of course, saying “Oh, you probably want me to get one of those new gas guns.” Though Dad passed away late last year, this was 1994 and the Browning Gold 20 gauge just came out. Though Dad had a lot of guns and a lot of 20 gauges, he never had an autoloading 20 gauge that really spoke to him. The then-new Browning Gold 20 with a 26 inch barrel finally did. It wasn't perfect out of the box, for recoil pad wasn't the best, the trigger was way too heavy, and the triangular safety took close to 20 pounds of force to get off. All that was fixed, though, and Dad finally had a new 20 gauge that fit him. The original Gold 20 was no flyweight, coming in at just over 7 lbs. But, compared to Dad's over 8 lb. A-5 standardweight, it moved like lighting and took off about 20 years of age in the field. It is also eerily recoil-free with 7/8 oz. loads. All you hear is a click, the clay explodes, and you can just barely feel the action working. Dad remained skeptical that his new Gold 20 could instill the confidence that he had in his A-5. The first nine shots out of that Gold by Dad resulted in nine dead Illinois pheasants, and that was that. It remained his most-used hunting shotgun for the rest of his life. In my Dad's case, it was a huge upgrade by going with a 20 gauge as opposed to his older A-5, for it instantly rolled back the clock 20 years or so for him, personally, in terms of field performance. A good 20 gauge often automatically nets you what 12 gauges often struggle to get to, in terms of fast-handling, slim lines, and light weight. It isn't an automatic panacea for everything, for if you are compelled to use steel shot, the 12 gauge always wins. As a dedicated clays gun, the 12 gauge invariably wins as well. Nevertheless, the 20 gauge is often a distinct advantage when hunting. A gun that shoulders faster and allows you to get on the bird faster means closer shots than a sluggish, comparatively non-responsive gun can offer. When a pair of nervous roosters cackle and flush, dropping the first pheasant quickly is close to mandatory for a dead-in-the-air rooster number two. If not strictly mandatory, it is invariably helpful. Over the years, there has been significant banter about bulky forearms and low-profile receivers. You won't easily find the slim forearm of a Benelli M2 20 gauge in a 12 gauge. You won't find the low-profile receiver of a Browning Cynergy 20 gauge in any 12 gauge O/U. How much that matters to you, personally, is up to you . . . but, there it is. Some will be surprised to discover that similarly weighted 20 gauges have less recoil than than their 12 gauge counterparts. It isn't that much of a mystery. One of the best 20 gauge pheasant loads is the buffered Remington “Nitro Turkey” loads, #NT20M5. It is 1-1/4 oz. of shot @ 1185 fps. Small wonder (no wonder, actually) that less recoil is produced with this shell than the over-hyped 1400 fps, 1450 fps, and 1500 fps 1-1/4 oz. 12 gauge “Super Duper” pheasant loads out there. The 20 gauge often patterns better than a 12 gauge, for you have less deformation on initial setback and less freebore: a 3 inch unfolded length 20 gauge matches the chamber better than a 2-3/4 inch shell can, and that increases pattern efficiencies. For all of these reasons, the 20 gauge is often a significant upgrade over a 12 gauge, something that is all too often overlooked if not ignored completely.